Tony has been hard at work developing a “mad thinker” device to help aid the Avengers in their mission to defeat the Phoenix. The Scarlet Witch plays an important role in this issue, since it’s her powers that the shiny hat requires to work. Once she agreed to allow her innermost thoughts to be projected for Tony and Beast to see, the room was lit up with probabilities and battle scenarios for the inevitable face off between the Avengers and the X-Men. After all the scenarios are played out and all seems lost, Scarlet Witch sees Hope standing in the doorway and everything changes. Suddenly, Tony realizes that he forgot to factor one member of the team in to the equation. The young teenage girl the entire team has been working hard to protect; Hope. This realization seems to give the billionaire something he hasn’t had in a while, hope for the future of the world and the end of the Phoenix power. This issue happens (time wise) right before Avengers Vs. X-Men Round 10 . If you haven’t already picked it up, I highly recommend it. Pre-orders have already started on Amazon for the graphic novel, due out in November. Infinite comics are a digital only series that is released occasionally alongside the Avengers Vs. X-Men mini-series. You can purchase them through the Marvel app or Comixology. Need some ideas on what to pull this week? Check out my pull list on Comixology. A graphic novel based on a pretend novel written by a pretend author — why not? I am a big fan of ABC’s Castle , but I have to admit that the Marvel graphic novel tie-in didn’t interest me until I saw that Kelly Sue DeConnick’s name on the cover. Since I’m a new fan of the Captain Marvel series also penned by Kelly Sue DeConnick, this week I decided to give Richard Castle’s Deadly Storm a chance. Deadly Storm is an adaptation of the first Derrick Storm novel written by Richard Castle, played by Nathan Fillion in the television series. 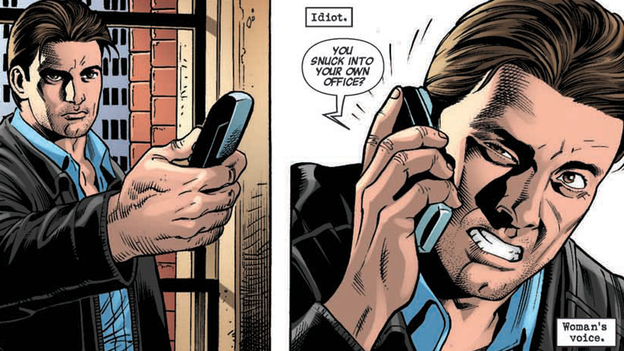 The title character bears a resemblance to Fillion, which helped me keep his voice in mind as I read. Derrick Storm is a private detective who finds himself in over his head on his latest case, where he crosses paths with the CIA and the beautiful agent Clara Strike. The story itself starts off strong, infused with mystery, humor, and action, much like Castle . The second half shifted from Storm’s musings to mostly action, which was still fun to read, but not quite as engaging as the first half of the novel. While I enjoyed Deadly Storm overall, I can only really recommend it to diehard Castle fans who are looking to complete their tie-in collection. Last week I pedicted that this issue would bring the climax of this Holly, Selina, and the criminals in the East End story arc, but now… tune in next week, folks! 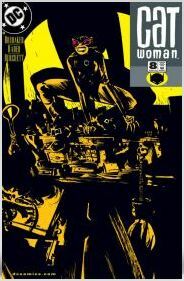 This week, issue 8 of Catwoman (2002-2008) brought a bigger conspiracy with someone pushing the buttons and presumably supplying the money to consolidate the crime in the East End, Selina’s home turf. The cops are circulating posters to try and find Holly while Catwoman and Slam are setting up a sting to capture the behind-the-scene nogoodniks. Once again, Slam and Selina show ease around each other. When Catwoman visits one of her old crooked pals, a pawnbroker and fence, he has to adjust to her new, benevolent ways. I liked seeing her interact with a new cast member, but it also highlights the occasions when she is tumbling around between the rooftops or climbing dizzying heights while expounding on a moral, ethical, or personal dilemma. Sometimes it is just served up a little too neatly. This issue also felt more loosely paced and paneled… not always a bad thing, but I was all revved up for a climax and instead found something more like the preparatory moments that precede a huge effort. I hope the payoff next issue deserves the long journey! Art by Max Peralta, age 13. Used with permission. Last week was the conclusion of my comic class for teenagers, which I co-taught with artist Len Peralta. In the second half of the course, we discussed inking, coloring and lettering. For the final session, the students had a chance to write and draw an original one-page scene–it was cool to see how our discussions about visual storytelling came into play in their decisions on how to stage their scenes. For me, the best part of teaching the class was when I heard one of the students remark “that was fun” on his way out! With the class’ small size and informal tone, Len and I were able to experiment with what to cover and how to cover it. It’s given me plenty of ideas about how to fine-tune lessons for future comic-teaching efforts. Thanks to GeekMom’s call to participate in Women Read Comics in Public Day, my daughter and I brought some comics along to a family outing in a park over the weekend. As it happened, a little boy spotted us, and expressed an interest in our comics–so we ended up sending him home with a copy of Mini Marvels . As we chatted with him and his grandparents, his grandmother shared some of her own fond comic-reading memories–apparently when she was a kid, her family kept their comics collected in a stack on the bathroom radiator. Now that’s accessibility. The past week also marked the release of the fourth and final issue of the SUPERCROOKS comic miniseries that I edited. Don’t show it to your young kids, but I hope any mature readers here who read the series had as much fun reading it as the creative team had making it. We just finished getting the collected hardcover edition ready for print, with beautifully-executed book design by Spring Hoteling. Anyone so inclined can find it on sale in October.